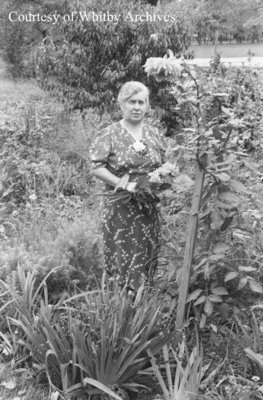 A black and white negative of Mrs. Mina Anderson standing in her garden and holding flowers. A baseball diamond is visible in the background. Mina D. Ross married John Alexander Anderson. They had two children, John Ross (1913-1939) and Mary. John Alexander Anderson, was Deputy Sheriff of Ontario County from 1935 until his retirement in 1958. Mrs. Anderson died on 28 March 1974 and is buried in Necropolis Cemetery, Cannington, Ontario. Mrs. Mina Anderson, October 3, 1939, Marjorie Ruddy. Whitby Archives A2013_040_783B.